The Transportation Safety Board of Canada (TSB) is recommending that Transport Canada work with the aviation industry and employee representatives to develop and implement requirements for a comprehensive substance abuse program to reduce the risk of impairment of persons while engaged in safety-sensitive functions. This follows the conclusion of an investigation into the fatal 2015 in-flight breakup of a cargo aircraft operated by Carson Air Ltd.
On 13 April 2015, the Carson Air Swearingen SA-226-TC Metro II was carrying freight from Vancouver International Airport to Prince George Airport, Canada, with a crew of two pilots on board. About six minutes after departure, the aircraft disappeared from radar. Its last known position was approximately 15 nautical miles north of the airport at an altitude of about 7500 feet. Ground searchers found aircraft wreckage on steep, mountainous, snow-covered terrain later in the day. The aircraft had experienced a catastrophic in-flight breakup. Both the captain and first officer were fatally injured, and the aircraft was destroyed. 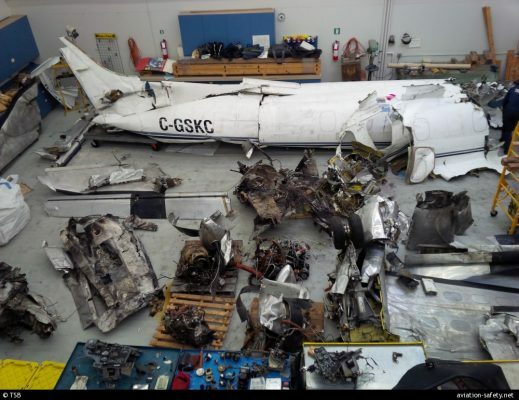 The investigation determined that the aircraft entered a steep dive, then accelerated to a high speed which exceeded the aircraft’s structural limits and led to an in-flight breakup. Subsequent toxicology testing indicated that the captain had consumed a significant amount of alcohol on the day of the occurrence. As a result, alcohol intoxication almost certainly played a role in the events leading up to the accident. However, without objective data from a cockpit voice recorder or flight data recorder, it is impossible to determine with certainty which scenario played out during the occurrence flight. The TSB has previously recommended the installation of lightweight flight recording systems aboard smaller commercial aircraft and flight data monitoring by smaller commercial operators, both to advance transportation safety and to provide data to investigators following an occurrence.